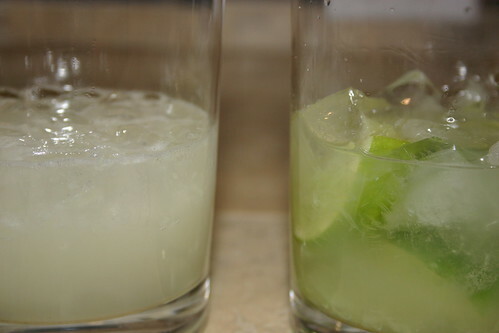 Sipping a Caipirinha truly makes you feel like a Brazilian, if only for a short time. The fresh lime flavor, sweetness and grassy flavor of the cachaça meld in to a truly wonderful drink. The flavor is extremely refreshing, not unlike a slightly alcoholic limeade. Not to mention these drinks are exceedingly drinkable. That said, as I discussed earlier in the week muddling this drink really is key to the flavor profile. As is granulated sugar rather than simple syrup. The muddling action extracts some of the oils from the lime peel which are then infused into the resulting cocktail. This changes the drink in the same way that a flamed orange peel or a lemon twist. So, what about the choice of sugar? I began my week using plain white sugar which worked very well. Feeling that I might be able to change it up a bit I tried using demerara instead. This helped to deepen the natural sugar flavors that the cachaça brings to the party. There is one downside to this choice though. Since the demerara sugar adds additional flavor it can mask subtle flavors in the cachaça. So, given that I’d say give it a try but make sure you choose a cachaça with a bold enough flavor to stand up to the demerara. 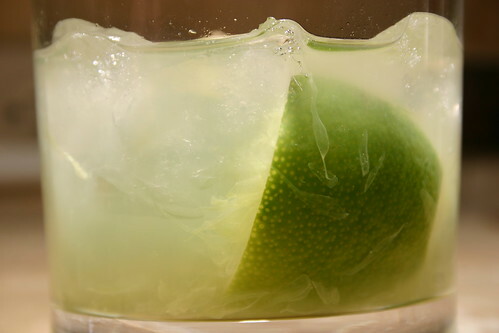 Although there are a few recipes for the Caipirinha floating around most of them seem to follow the same general formula. Namely: 1 oz cachaca, 1/4 lime (cut in to two wedges), and 1 tsp sugar. Some recipes, Gary Regan’s for example, call for three ounces of cachaça. That’s going to make for a pretty hefty cocktail and since these go down very easy it could get out of hand pretty quickly. With that in mind my suggested recipe cuts back the cachaça to only two ounces, but keeps the formula the same. I highly suggest you mix one up and enjoy the carioca life. Even if it is fleeting. Today is the day folks. Whether you think of it as Fat Tuesday, Mardi Gras, Shove Tuesday, Pancake Day or, as the Brazilians know it, Carnaval, today is a day to celebrate. For you Catholics out there today marks the last day before the beginning of Lent. Lent refers to both the 40 day period prior to Easter Sunday and the tradition of fasting from certain foods or practices. In the US you’ll find most people practicing Lent by giving up a food they love, typically junk food. My Grandpa Lloyd for example would always give up watermelon for Lent. Which worked out particularly well for him since you generally couldn’t get it during Lent anyway. But, I’m not here to talk about Lent. I’m here to talk a very small bit about Carnaval. No, it’s not spelled wrong. 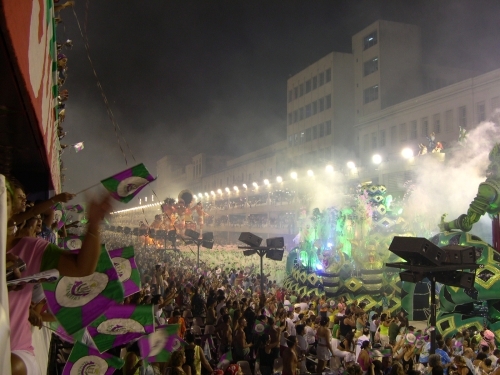 Carnaval is the correct Portuguese spelling of Carnival and is probably the most well known event in Brazil. Carnaval consists of a number of days worth of partying, dancing and parading culminating the four days before Ash Wednesday. Groups will congregate and form blocos which assemble and then parade throughout the city. In Rio de Janeiro you get the addition of the local Samba schools who compete in the four night Sambadrome. Which, never have been to Carnaval I can only assume is very similar to Thunderdome. That’s probably not true at all, but it would be awesome. If you’re looking for a party but sadly don’t have decorations to make it happen head on over to Leblon’s website and pick up your very own Leblon Carnaval Kit. The kit comes complete with masks, beads, glow sticks, and even a music CD to put your party in the right mood. Add to that some Caipirinhas and you’ll be set for a night of partying. In honor of Carnaval and Mardi Gras tonight I’m hosting a cachaça tasting at my house complete with homemade gumbo in true New Orleans style. I’ll be posting the results later in the week.